Above: DezsÅ‘ cleaning the heating rods found in our water heater. As you can see the water is full of delicious minerals. After a few days of hot water, our heater began acting up again. After a day and a half of no hot water, DezsÅ‘ and Miki came to the rescue and found the source of the problem. The person who installed the new part (that began this whole saga a few weeks ago) failed to install a 93 cent specially made washer. 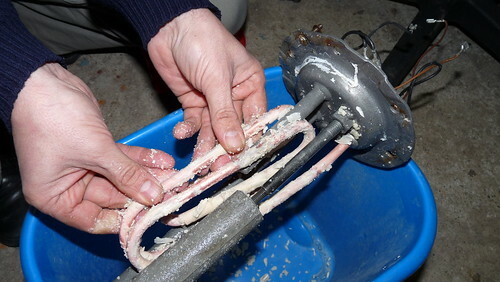 Without this washer, the boiler leaked constantly on the newly installed wires, which were then destroyed. I’m thankful for friends who are willing and knowledgeable to help! Above: Part of our poster. 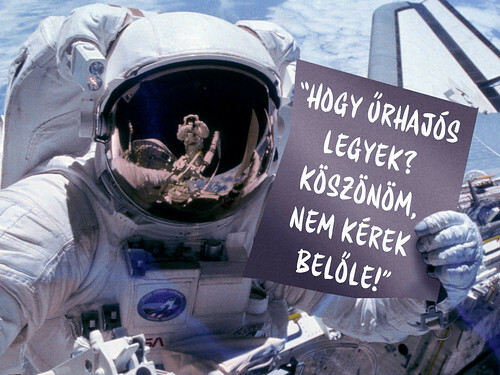 Translation: Train as an astronaut, no thanks I have better things to do. 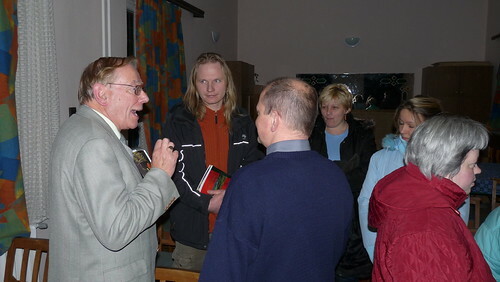 We held an outreach on Monday night with guest speaker Dr. Eric Barrett. He did an excellent job relaying the story of his interest in science and invitation to train as an astronaut at NASA. 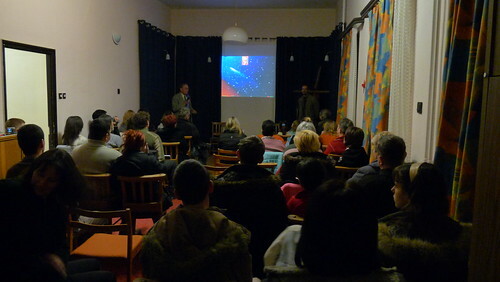 It was clear that he captured the attention of over thirty people who attended. Towards the end of his lecture, he used one of his research projects as an illustration for the Gospel message. 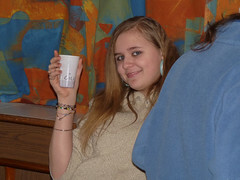 We praise God that all of our morning English Club students attended, and student Klári also brought her husband Tibór. For many of them, this is their first exposure to the gospel, or their first exposure to the idea that even a scientist could with all of his heart believe in Jesus Christ. We rejoice with church member DezsÅ‘ also, as his father attended who seemed to be more open toward the idea of God after this lecture. Above: For the past two weeks, Edina (left) and Timi (right) have been coming to the English Bible study. We are very thankful for the trust that has been developed over the past year through the English Club. Because of this, they are much more open to share personal thoughts and questions about God. Through this study, we have challenged them to put away their preconceptions about God and allow the Bible to reveal to them what God says about Himself. We are starting from the beginning in Genesis and will work our way through major Biblical events that lead to the Messiah's coming. Please pray for Timi and Edina, and also for Tünde and Klári who have not been able to come because of weather, or commuting issues. 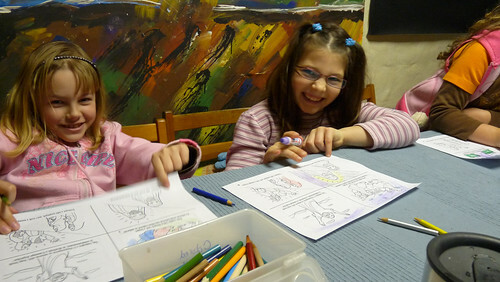 Above: Klári and Tünde in our Thursday morning English Club. At break time last week in English Club, Tünde began talking about her diet and meditation to Edina. I just listened until she turned to me and said, "right" to gain my agreement. The problem is that I didn't completely agree with what she was saying. From what I could gather from her comments, she believed that our spirits could be cleansed in a way through what we eat. Timi, who also joined the coversation asked, "What is it that you don't agree with?" I was able to share that according to Jesus, our spirit cannot be cleansed through physical means, but the physical can be effected by the state of our spirit. I was able to talk about the need to get healing of the spirit that led to healing of the complete person. The conversation then turned into Tünde talking about the philosophy of "all paths leading to the same God". I tried to help her think through the contradictions found in this philosophy. I talked about the various differences of other world religions when referring to who God is, how to know Him, what comes after death, and the explanation of evil or sin. As there were Bibles sitting on the table, I referred her to Jesus' words found in John 14, where Jesus claimed to be unique and the only way among all supposed ways. Tünde ended by saying we were talking about the same thing, and that she does believe in the God of the Bible. I was later able to put together a small study of scripture that made these Biblical truths clear. 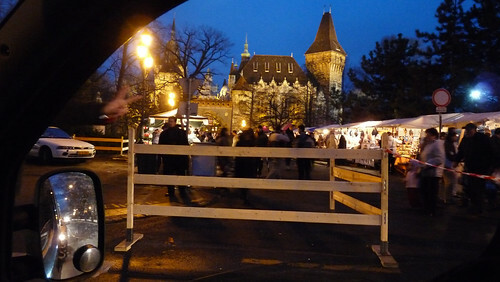 The following week in English class, Tünde happened to ask me at break time how I was led to Hungary. Edina and Timi also happened to be sitting at the table when this opportunity for me to share my testimony came up. When I got to the point in the story where I told Sharon that I loved her for the first time, Sharon walked in from being out shopping. She also shared some details of our story and then she realized (with her super memory) that today, Feb 26th marks the anniversary of that day when we expressed our commitment to each other for the first time. God works in amazing ways! Tünde who initiated the conversation that led to retelling what happened on this very day years ago could only say, "God is at work." I tried to make the point that God is a trustworthy Father that I willingly follow. He has a far better plan and purpose for my life than I could have ever imagined. He stopped me years ago from continuing to sprint forward in my own way without Him and saved me from a life wasted for my own glory. The greatest joy and satisfaction comes from knowing that I am fulfilling my purpose in glorifying Him. All of this conversation also ties into previous talks I have had with Timi and Edina in our English Bible study. Praise God for opening up these opportunities. 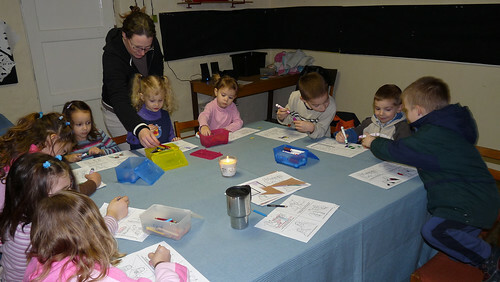 Above: Sharon helping in Sunday School. Above: DezsÅ‘ and Marcsi’s daughter Betti and Miki and Erika’s daughter Anna. Teammate Brenda has been meeting consistently with the women in our church to teach them about prayer, and to equip them to someday lead their own prayer group. God has used this time to get us closer to the fellowship that I believe God desires for us, as women are sharing deeply with each other, encouraging each other and taking burdens together to the Lord in prayer. Marika, a member of our church who attends the group realized last week that Hungarians grow up in a culture of sadness and complaining. She said, "We can't let this continue in our new faith, we need to learn how to be joyful in the Lord." Praise God for using Brenda to encourage this group and praise Him for the ways He is transforming their thoughts for their benefit and His glory. 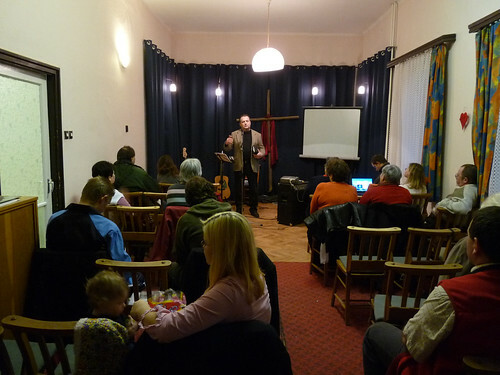 After Worship Service, Érzsi's husband Béla expressed his interest in being baptized. He said, "Really, it's not me just following my wife, I have made a personal decision. I want to be baptized." Béla will be meeting with Miki over the next few weeks to prepare for baptism. Above: Dad dancing with Elianna at a preschool celebration similar to halloween but without the door to door candy collecting. 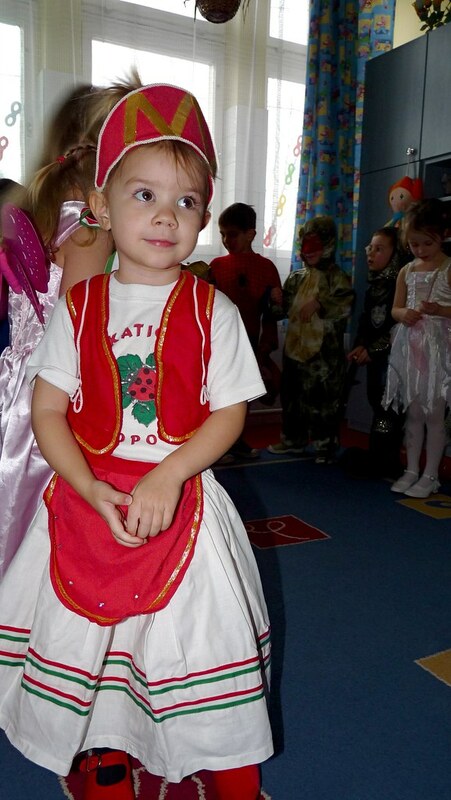 Above: Kira joining in on the fun in traditional Hungarian dress. Above: Ben making a valiant effort at a goal in practice. 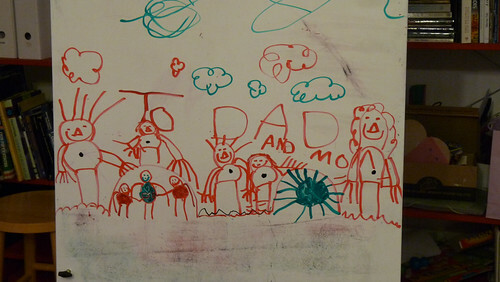 Above: Elianna usually leaves these type of beautiful pictures for me every week before English Club. Above: I spent lots of time this week dealing with our hot water heater. 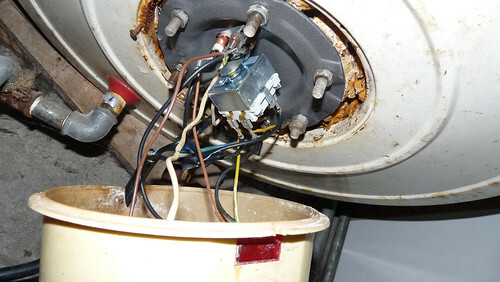 A simple replacement of the insides of this boiler (by someone else) turned into a electrical leaking mess. It was comical how difficult it was to track down an electrician. The dialogue with the man at the local electronics store went something like this: “Could you recommend a local electrician?” Man at counter, “grunt”. “Could you recommend a place where I could look for an electrician?” Man at counter, “No.” “You don’t know any electricians?” Annoyed man at counter, “No.” After this productive exchange of information, I (being prepared for this type of dialogue) whipped out some photos to explain my problem. The man threw some wires together, some connectors and I tried to understand what he said I needed to do. As you can see in the photo above, the electrical portion of the boiler is ingeniously placed below the water storage area. This means that any leakage that begins to occur flows first to all of the wires. After shutting down the power, and carefully replacing a bunch of old crumbly fried wires, I thought I would be able to flick a switch to see if there was success. However, hot water heaters here are connected to a separate circuit box which is only activated after 9:00 at night. I could go on, and on, but the good news is that the leaks have stopped, the water heater is working, and the kids can have baths. This has raised our awareness and thankfulness for the blessing of having hot water every day. On Wednesday, we launched our English Bible Study as a bridge for students that have attended our English Club to hear more about Jesus Christ and the Gospel. Above: Unfortunately, not all the students pictured above came to our new Bible study. Timi (above right blond hair) was the one student that did come. We were not sure if it would be awkward for her to be the only one for the study, but we felt that this introductory class went well. We discussed the two world views of existence: That all that exists came from chance or that it came about by design. If by design, is this Designer knowable or unknowable. And if knowable, how can we know this Designer. When we began discussing the validity of the Bible, Timi revealed that she is studying to be a literature teacher. She said that she has taught the Bible in her practicum classes as a fine piece of literature. She also mentioned in class that she sometimes feels the presence of God. Please pray for Timi, that she would come to receive the Bible as more than just fine literature and that she would come to know God more than just a feeling through Jesus Christ. 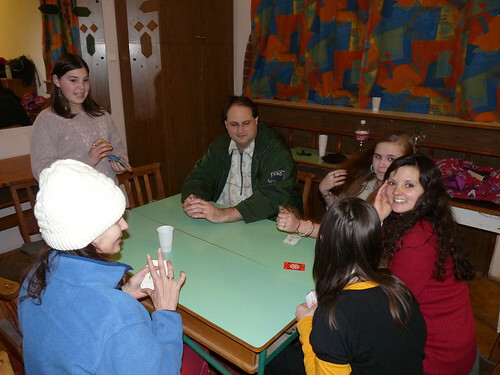 Above: New student Olivia (far left) came with a car load of people from the neighboring town of Zagyvaszántó. Olivia also attended our VBS last year. We were glad to be back in touch with her. 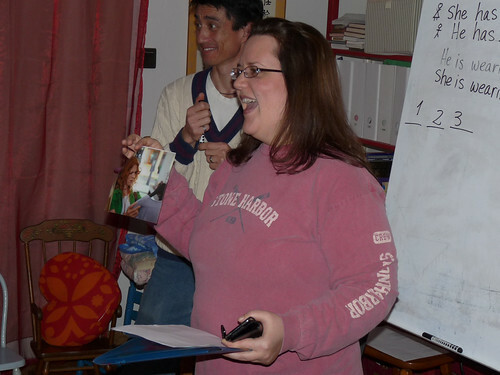 Above: Brenda laughing with the class as a team mistakingly chooses a picture of a woman with red hair when they should have brought back a picture of a man. Hungarian language has no word that specifies he/she/him/her. The word they have is genderless. 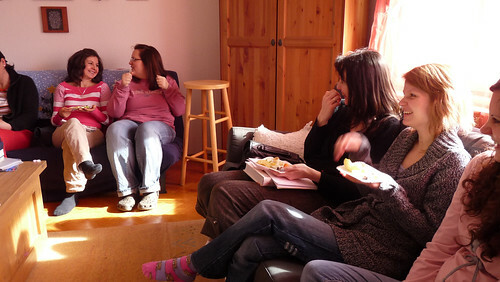 Above: We praise God for a big living room to host this class. In contrast to last week, lots of people are getting over their sicknesses and we had a full house. 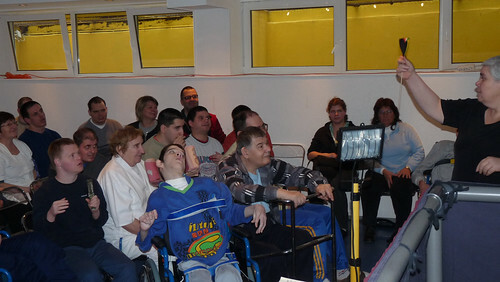 Above: Jozsi (far left) has only attended our club a few times. We really hope to get to know him better and would appreciate your prayers for this young man. Above: Two new teens dropped by for our Friday Teen Outreach. They came at just the right time since we were breaking for our small group discussion. With the help of teammates Heidi and Roger, we are able to split up the teen boys and girls and talk more seriously about life issues and God’s view as found in the Bible. 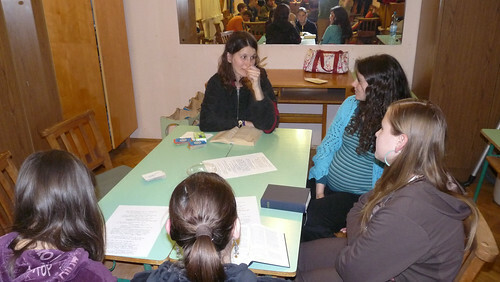 Above: Heidi leading the teen girls small group. 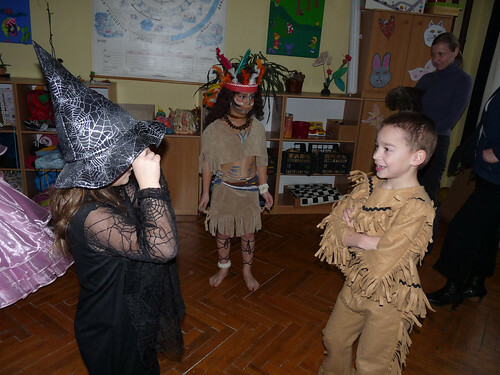 Above: Farsang is a Hungarian holiday similar to halloween without the trick-or-treating. 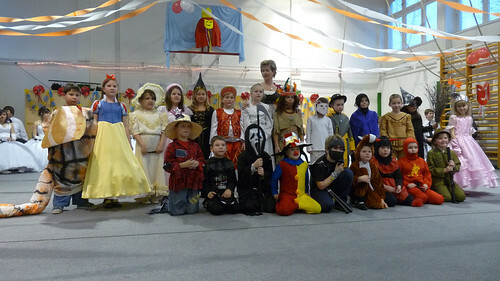 In Ben’s school, various classes prepared dances and sought to win the prize for most creative costume. The graduating class in his school treat Farsang more like a prom dance. 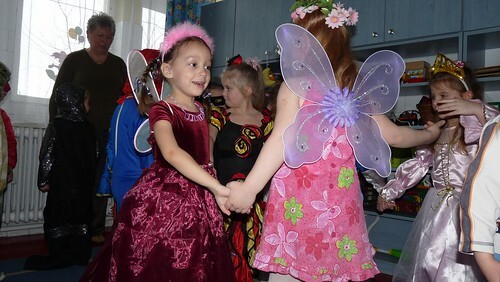 The girls are decked out in fancy dresses and dance a type of ball room style dance with fathers or close friends. 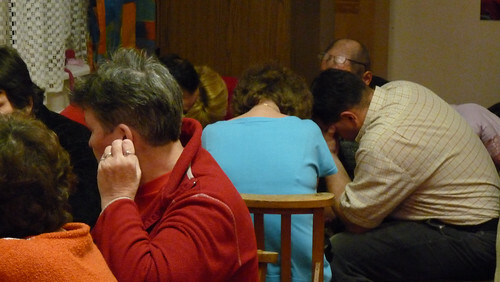 Above: Small groups praying for one another after our time of preaching God’s word. 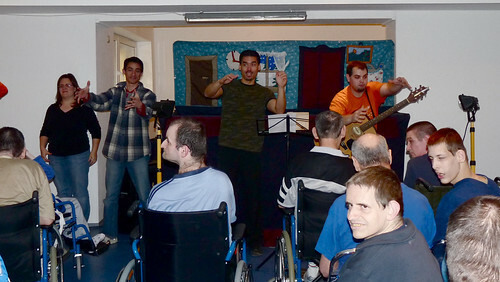 We were thankful to see most of the members present after many had been suffering from sickness. In a church this size, you really notice when a few are sick. As I have mentioned in previous posts, families in this church are really struggling financially. Many are having tough times finding work as many companies are downsizing and also struggling. Please pray that those seeking work would be able to find it and that God would provide for them. • Kira and Elianna are on the road to recovery after a few weeks of being sick. • Timi (english student) attended our Wednesday English Bible study. Two other students commented the following day that they intended to come next time. • Please pray for students to come to Wednesday’s English Bible study. Pray that God would reveal Himself to them through our Bible studies. • Please pray for Friday’s teen outreach, specifically for our small group discussion time to draw these kids closer to God. • Pray for teammates Roger and Heidi who are sick and need rest, rejuvenation and physical healing. 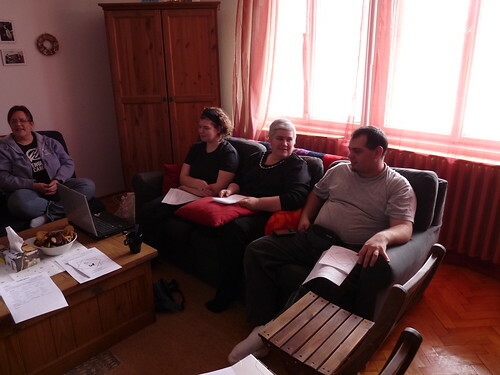 • Please pray for church members that continue to look for jobs after being laid off in Hungary’s bad economic situation (Gábor, Laci, and Eszti’s husband Peti). 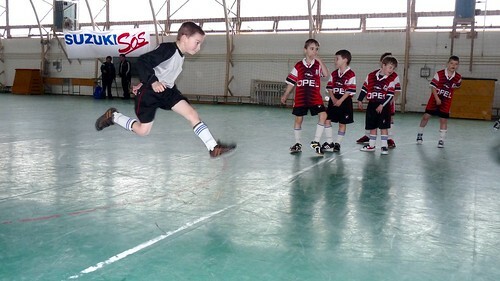 Above: After weeks of practice in his little village gym, Ben along with his team traveled to the town of Hatvan for his first soccer tournament. Stepping into the gym in Hatvan must have been a shocker for these kids, as it is probably 9 times as big as the one they had been practicing in. Out of the five teams that competed, Ben’s team came in last. 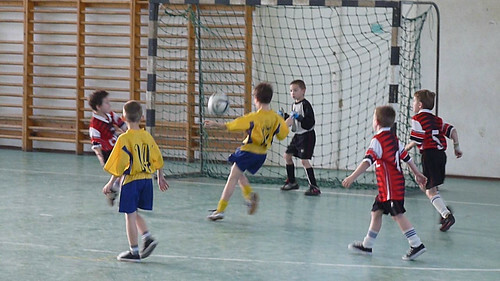 Tough day as Ben was the goalkeeper. They were clobbered. The good thing is that they had a great time and through this I am able to meet parents of Ben’s classmates. 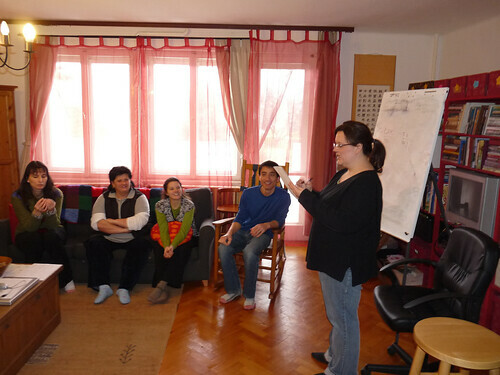 Above L to R: Edina, Csilla, Heidi, Roger and Brenda leading the first part of English Club. 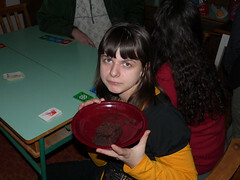 This was Csilla’s first time to our new English Club. Last year, she attended our classes in the local community center and even stayed after several times for our Bible study. Because of serious health problems, she was restricted to stay at home. We were thankful to have her return on Thursday. Csilla also brought her son Csaba, who has attended a few of our evangelistic English Camps in the past. 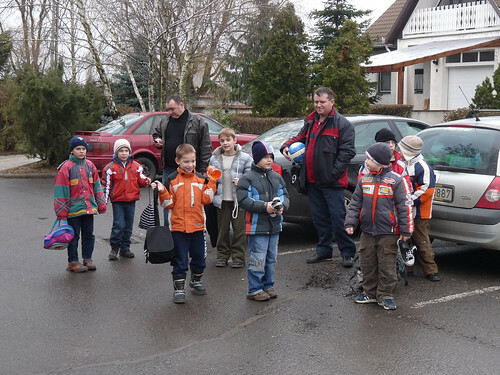 Csaba expressed interest in this year’s camp and may be able to go with a few friends. 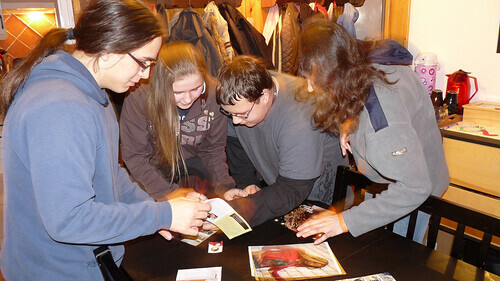 Above L to R: Timi, Klári and Csaba competing in an ice breaker game. Above L to R: Vali, Dávid and Niki in our night class playing the same game. Unfortunately, the flu has reached an epidemic level in Hungary. The effects can clearly be seen in the attendance at schools, at our church and also in our various ministry outreaches. Practically half our team is currently sick, and many in the church also have the flu. Please pray for our students and for us (Miki, DezsÅ‘, Brenda, Roger, Elianna and Kira) to fully recover. Above: Maybe the teen’s immune systems are a bit stronger than ours as we had a full house on Friday night. 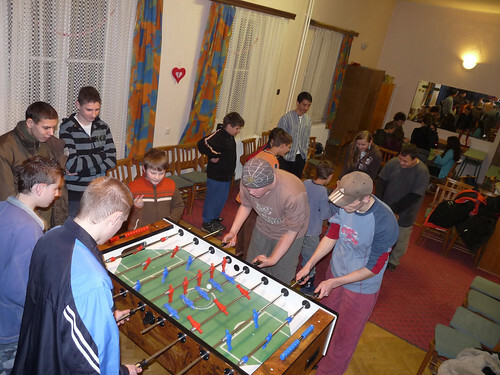 We continue offer a safe place for them to go to on Friday nights for card games, fuse ball and snacks. 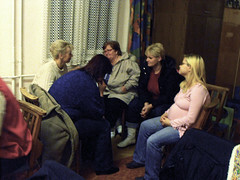 We praise God for the successful implementation of small group discussions which help us to get to know real issues going on in their lives and allow us to communicate God’s truth from His word. 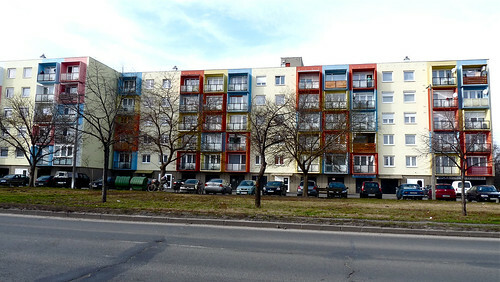 Above: Passing colorful buildings on long commute to the town of Dunaalmás. Above: The orphanage/special needs home in Dunaalmás houses around 130 men. It stirred the heart to be there and to see their joy and excitement with the puppet show and with singing. 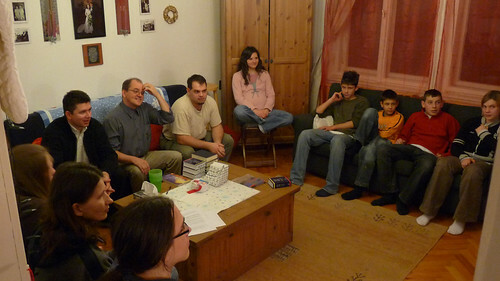 Above: Although many of the men have limited understanding, there were others in the room who could follow Julika’s presentation of the Gospel after the puppet show. This center is maintained by the Reformed Church and the facility was well maintained with workers who had a heart for this ministry. When Julika brought up John 3:16, we were amazed that the entire room burst out skipping ahead of her and saying the verse from memory! These men have a worship service every Sunday, and it was a joy to see their childlike knowledge of God’s Word. 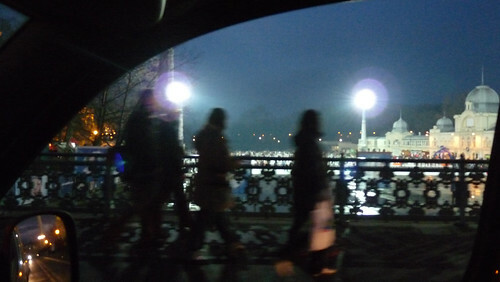 Above: Catching some of the beautiful scenery of nightlife in Budapest as we returned home. • Healing from the flu for family, team and church members. • Wednesday we will launch an English Bible Study. Pray that students would come and be drawn to put their faith in Jesus through these classes. Above: Julika (seated center) with daughter Mani on left and our teammate Miki on the right. We praise God for his grace in extending Julika’s life with us as she struggled with cancer last year. We spent time together on Monday praying for our Summer VBS and laying down initial plans. VBS has been effective in establishing a good reputation for our church in our town, connecting with children and parents from surrounding villages, and sewing seeds to the next generation. We are already excited about the theme of prayer for this summer’s VBS. There are many in our church that are affected by the recent troubles with the economy. People are getting laid off, and since businesses are also cutting back, it is difficult to find work. Please pray for our members who are struggling financially. Above: Tünde, Klári, Edina, Hugi and Timi. Timi is a new student and a friend of Edina’s. It is always encouraging to have other students inviting their friends and we are hopeful that Timi will also attend our English Bible study that we will be starting later in February. Above: Providing a safe environment for the teens to hang out on Friday night. After about an hour of games, we have begun to break up for small group discussions with the teens. 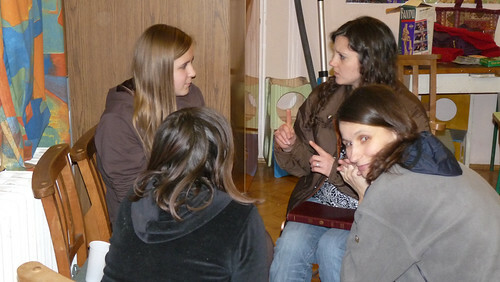 Teammate Roger has developed discussion questions, and teammate Heidi (in Red above) has helped us by leading the teen girls discussion group. 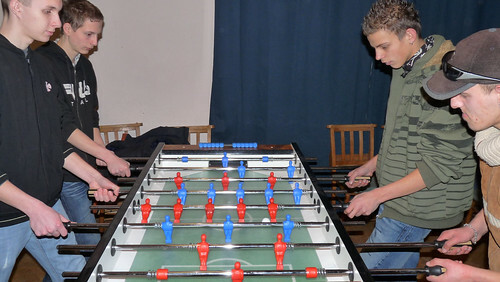 Above L: Viki, Above R: Niki. Viki showing off some of the baked goods that she made at Heidi’s house earlier in the day. Niki is a regular attender to church and teen outreach. Please pray for these teens to have softened hearts and open eyes to God’s truth. Above: Long time friend Péter, who has been of constant encouragement in the years of the formation of this church, commuted from Budapest to preach about the characteristics of a disciples of Jesus Christ tonight. Above: A very important part of our worship service where we break off into small groups to pray for one another. 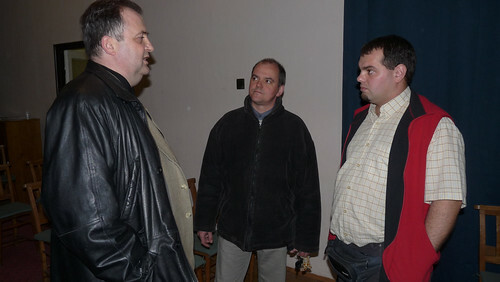 Above: Péter, DezsÅ‘ and Miki discussing the blessing of supportive mentors in their lives. • Answered prayer: LIdia returned to the worship team today (after being sick last week) and did a great job singing with church member Hugi. • Kira (although still coughing a bit) has been having a better time at sleeping through the night. • Saturday we will be presenting our Puppet Show to a orphanage. Please pray for God’s love to be poured out to these kids through our presence and His message. • Many church members are struggling because of the economy and the lack of work. Please pray for God to provide jobs for those seeking.